Prefabricated construction is at the forefront of innovative building design but the construction and design methods behind Rothelowman’s La Trobe Tower have resulted in a new record for the building as Australia’s tallest prefabricated high-rise structure. The La Trobe Tower utilised a unique prefabricated construction method developed by construction company Hickory Group – Hickory Building Systems (HBS). Hickory has become a world leader in prefabrication for tower projects. George Argyrou, Hickory’s joint managing director and co-founder, gives insight into the company’s design process, methods and technologies that are dramatically reshaping the construction landscape. How does the construction of the La Trobe Tower demonstrate innovation and flexibility in prefabrication? George Argyrou: The 133 metre, 44-level La Trobe Tower has used an innovative prefabricated construction method developed by Hickory Group in order to become Australia’s tallest prefabricated building. Delivered 30 percent faster (eight months earlier) than would have been possible using a conventional approach, the project is one of the first of its kind in the world and the way it was constructed has proven to be a safer, less disruptive and more sustainable way to build. Hickory’s construction method used prefabricated building elements including modular bathroom pods, precast concrete slabs and pre-attached windows. The basic structural architecture was designed to be scalable with occupancies that can span across multiple modules to generate generous floor spaces, and has the flexibility to provide limitless spatial layouts and capability to build to any height. In another first for Australian construction, Hickory installed much of the high-rise structure during extended construction shifts, trucking in the oversized prefabricated components at night to avoid disrupting tram and vehicle traffic on La Trobe Street. A quiet electric crane and strict noise control measures were put in place and monitored throughout the eight month night work period to ensure neighbouring residents were not disturbed by the activity. The prefabricated building methodology has revolutionised the relationship between builders and designers in demanding a much closer working relationship between the two as opposed to a traditional build. 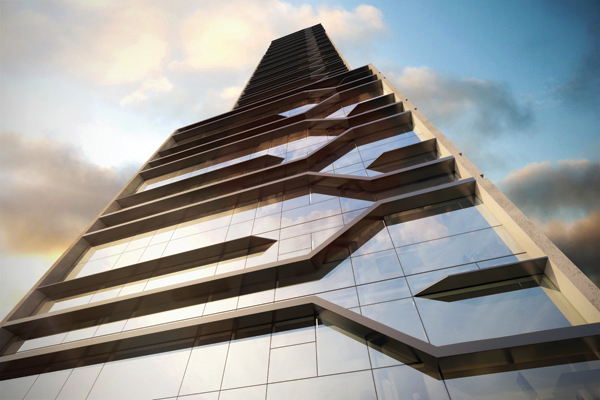 How involved was Hickory in the design phase of the La Trobe Tower? The implementation of Hickory Building Systems (HBS) necessitated high levels of collaboration among the builder, engineers, architects and consultants. The nature of the system allows for greater integration of all the partners to achieve the best project outcome and offers a best practice, collaborative project management model for the industry. The hybrid manufacturing and construction model means we had to do more modelling up front, extensively employing Building Information Modelling (BIM) in the design process. This created greater visualisation and collaboration for all project stakeholders to understand how the building would come together. A number of design details were produced in consultation with the production team. In order to assess the viability of the HBS modules, engineers carried out engineering analysis with FEM modelling and also carried out prototype testing in accordance with Australian Standards. Through prefabricated construction methods, Australia has set a precedent that will be replicated across the globe. Is Hickory currently undertaking new developments or improvements to the prefabrication system? Through the learnings gained on the La Trobe Tower project, Hickory has developed and implemented a number of key improvements in order to gain further time and quality advantages on HBS projects. This includes the use of removable recyclable props in future iterations of the system, which will enhance sustainability aspects of the system and reduce costs. Since the successful implementation of La Trobe Tower, we’ve also been approached by construction groups in London, Tokyo, Singapore and New York that are keen to explore a joint venture arrangement in order to utilise HBS construction for international projects. In this way, Australia has set a best practice model for high-rise construction that may soon be replicated in many of the world’s major cities, effectively exporting our engineering innovation on a world scale and benchmarking Australian construction IP among the world’s best. In a keynote presentation at the Australian Smart Skyscrapers Summit later this month, George Argyrou will discuss the prefabricated construction processes used in the ground-breaking La Trobe Tower project and why system flexibility and continuous innovation is imperative to implementing prefabrication on a larger scale. The Australian Smart Skyscrapers Summit features a wide range of local and international speakers involved in all facets of building and design processes in major high-rise, mixed-use and sustainable projects shaping the Australian skyline. Panel discussions, networking opportunities and an environment fostering continual learning and improvement will structure the two-day event that runs on 28 and 29 March at the Melbourne Convention and Exhibition Centre.